Power Girl hurtles through DeSaad's boom tube in search of her friend Huntress. She arrives in a bunker-like base, where she battles para-daemons and tries to beat Helena's location out of them. Meanwhile, DeSaad usess a lightning wand to try and extract fear and pain emotions from Helena, which seem to fuel his power. He realizes Power Girl is in his base, and heads off to confront her, giving Huntress a chance to pick her locks and escape. 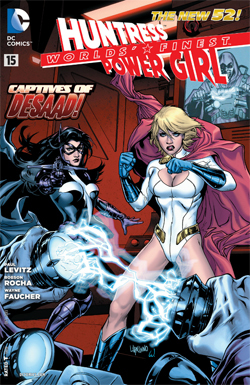 Huntress defeats a strong-man slave of DeSaad's and joins Power Girl in the fight against him. But DeSaad says he has extracted what he needs from Power Girl, and uses another boom tube to return them to England. When they arrive, Power Girl says DeSaad has "screwed up" her powers -- her costume is torn and she is cut and bleeding (both of which should be impossible due to her Kryptonian physique). This is another solid, though not outstanding, effort from Paul Levitz. He continues the story of DeSaad and the two girls, stranded on Earth-prime, trying to get back to their own Earth-2. Although the "rules" for the New 52's Apokolips are not clear as of yet, I suspect DeSaad is wasting his effort -- Apokolips in the past has been a world that spans universes, so he probably doesn't need to return to Earth-2 to get "home." However, he thinks he does, and for several issues now has been trying to obtain the "secret" of doing so from Power Girl and Huntress. This is another example of DeSaad being out of the know, however, because to date, neither of these women knows how to get home, or they would already have gone back. The story is fairly straightforward, and mostly consists of action. There isn't much character development here, which unfortunately has been the weak point of this series. Fortunately, however, Levitz does a good enough job with the action, the narration by both girls, and Karen's quips during the battle, that the read is entertaining, if relatively shallow. DeSaad makes a classic, over-the-top arch-villain for the girls, and we see some traces of the old Levitz from his Legion days back in the '80s, when he turned in fantastic scripts for story arcs like the "Great Darkness Saga." He clearly still has the chops for great dialogue, but it's something we only see occasionally. The artwork turned in by Emanuela Lupacchino, on the other hand, is a pleasant surprise. I've never heard of her before, but in this issue, her art is absolutely first-rate. Her layouts are interesting, and she draws both Huntress and Power Girl extremely well. The "special effects" of the artwork (boom tubes, electric wands, and so forth) look fantastic. And she also does an excellent job with background detail. This series has suffered in the art department, not from poor art, but just from having a different artist every other month, and as a consequence it has not achieved a consistent look-and-feel. If they're not going to have George Perez on this book (which they can't, now that he has quit working for DC comics), Luppachino is an apt replacement for him. Her artwork is simply gorgeous, and I will definitely be keeping an eye out for her in the future. Overall, this was a solid book with the art more impressive than the story. The story-line was fairly simplistic, long on action and short on character development, but the story was definitely entertaining and also easy to follow (neither of which are standard fare in comics these days, sadly). I know this book isn't selling well (it ranked 100th in last month's Diamond report, selling just over 20K), and on that basis I suspect it may be canceled fairly soon. But I will stick with it as long as Levitz keeps turning out decent stories, and I would not be disappointed to see Emanuela stick around for the artwork.